Dani's new home isn't just another stopover in a long chain of places she'll never see again, it's the home of both Caine and Jerek, two guys like nobody she's ever met before. One represents the best friend she's been hungering for, and the other represents something much more. It should be the perfect recipe for a fairytale, but Caine and Jerek live in a dark, shadowy world and one of them is hiding secrets that will change everything, secrets that relate directly to Dani. 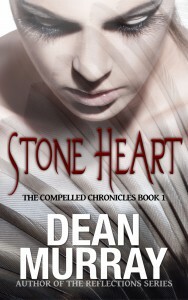 Stone Heart is an exciting new Young Adult Paranormal Romance.